when i reviewed Faces Nail Enamel Kermit green i mentioned i received a small hamper from Faces , Faces Nail Favorites French02 was also a part of the hamper (it had a small paddle brush too. will post soon). 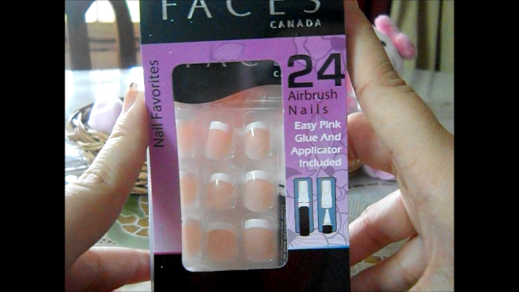 Personally i don't like wearing false nails as i thought they can damage my natural nail bed, but i really like these Faces air brush nails. I was little disappointed when i found out that the applicator was missing but honestly it wasn't much of a problem, you can do well without it. These air brush nails are reasonably priced at Rs 299 and you get 24 pieces, so you have lot of options to try and see which fits your nail perfectly. These are great if you have very tiny nails or your are running short of time to attend a special funcation , these are perfect for every occasion. Here are some pictures followed by the video. Click HERE for the Demo video on my channel. Leave a comment below if you have any queries or suggestions. They definitely look awesome !!!! how much do they cost !! !